One of the most important areas for consideration and generally the most overlooked is the selection of the correct filter media. 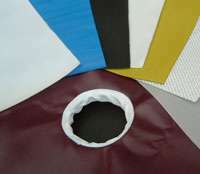 It is extremely important to choose the optimum filter fabric for the intended application. It is essential the correct media is selected to eliminate the passage of solids through the filter but allow free drainage for the filtrate to exit the chamber, aid cake release on discharge, and be chemically resistant to the slurry to be filtered. Filter cloths in a variety of yarns,woven constructions and surface finishes are produced to ensure there is a product to meet your requirements.